This principle can make such a difference as a teacher – or a parent – or, frankly, in almost every aspect of our lives. 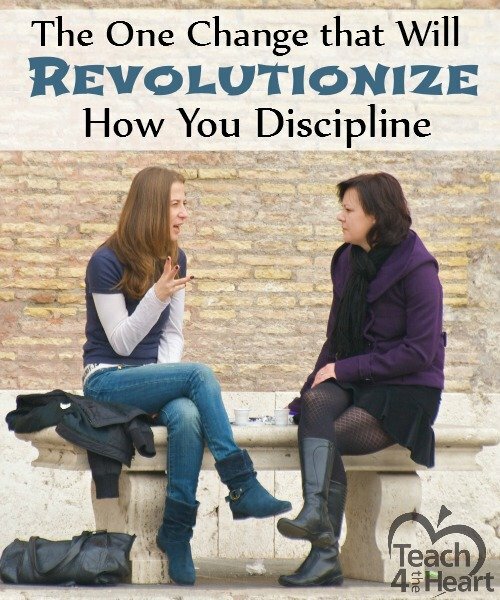 But I believe it is particularly helpful when trying to discipline and disciple young people. When we get into “lecture mode” and just start telling the child or teen everything they did wrong and everything they need to do differently, they may or may not be listening, and we may or may not be helping them. But when we stop and listen to their thoughts first, we can then tailor our response to actually help them with the issues they’re facing. Let me give you an example…Let’s say that you caught a student cheating. Instead of launching into a lecture, you first ask the student why she was cheating and take the time to wait patiently and ask follow-up questions until she starts to open up. She finally admits that she’s deathly afraid of failing your class and that when she couldn’t remember the answers the temptation to peak at her neighbor’s paper was just too much to resist. Her admission shouldn’t affect the consequences of her cheating at all. But it should definitely help you counsel her. You now know that you need to talk to her about how to handle her fear of failing and how to resist temptation. In addition, you’ll probably want to give her some additional ideas for how she can succeed in your class. And won’t that lead to such a more impactful conversation than you would’ve had if you’d just yelled at her for cheating and/or handed out a punishment? Now I bet I know what you’re thinking – “I don’t have time for this!” And I hear you. I know how busy both teaching and parenting can be. And I know I’ve let too many opportunities pass by because I didn’t think I had time to deal with them. What is your big-picture goal? But the question we all need to keep in mind is – what is our big-picture goal? Isn’t it to make a difference in the lives of those kids we see every day? Isn’t that more important than all the other items on our to-do list? We’re not going to physically be able to have this type of conversation every time a student is talking out of turn or every time a child starts complaining. But when larger and/or chronic issues arise, it’s absolutely going to be worth it to take the time to seek first to understand. And, actually, it’s going to save us time in the long run because we’re able to get to the root of the issue and hopefully find real solutions that will keep us from having to deal with the same issue 20 more times throughout the year. So what about you? Do you seek first to understand before seeking to be understood? What difference have you seen this make in your classroom or home? I love it! Specially the part that says we should understand before being understood. It’s so true that sometimes our first reaction is to lecture, and then we keep wondering why the students didn’t really pay attention to us. This is amazing! Thanks, Linda! Love this timely reminder. Thanks. “…what is our big-picture goal?” This says it all, it’s all about priorities. By the way, Proverbs 15:32 He that refuseth instruction despiseth his own soul: but he that heareth reproof getteth understanding. Thanks for the post. I couldnt agree more with your post! I believe it can be extended beyond our interactions with children. Imagine if we sought to understand before asserting our own point of view with others. It could cause true change in relationships with others. Thanks for your post!